So far we’ve come a long way both in terms of features development but also in growing our relationship with our customers. Now, having just launched a major upgrade, we feel ready to take on more businesses which can benefit from our new features and so, we thought it’d be a good idea to look at who our current customers are. True to our mission we serve very small and small businesses having less than 15 people in their staff. In fact 90% of the business have 1 to 5 employees with a fairly uniform distribution within this range. Whether talking about thousands of different products (SKUs or stock-keeping units to use the appropriate jargon) or just a few tens, megaventory is up to the job. About a third of our customers have less than a hundred products, half have between 100 and 1000 and the rest have more than a 1000. Any type of small to medium business can essentially be catered for. 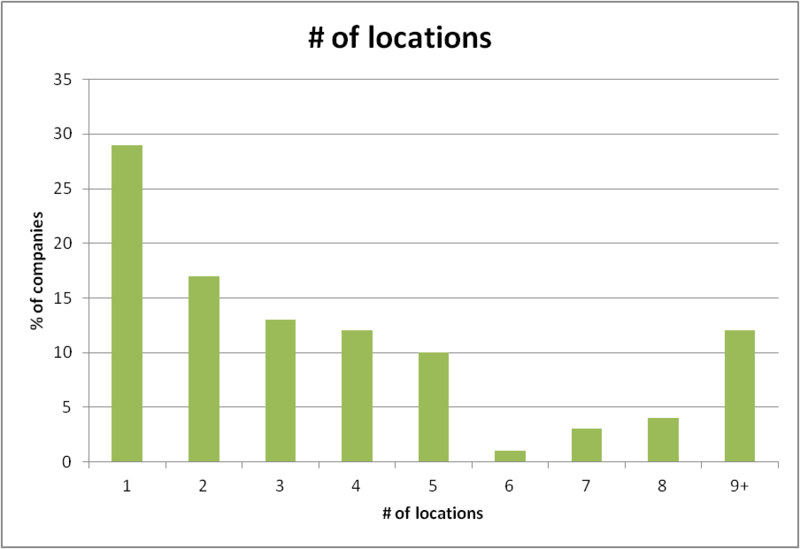 Another important parameter when it comes to inventory & order management is how many locations products are spread across. Locations might include both a warehouse where stock is stored but also a shop or shops where the goods are sold or distributed from. Although we offer a range of services even for single-location businesses (about a third of our customers has just one location), the rest are multi-location with a significant portion having 9 or more locations. It’s clear that regardless how far a business spreads, megaventory can handle the complexity easily. In fact our seamless simultaneous handling of multiple locations, multiple users and multiple currencies is one of the strongest points of megaventory. 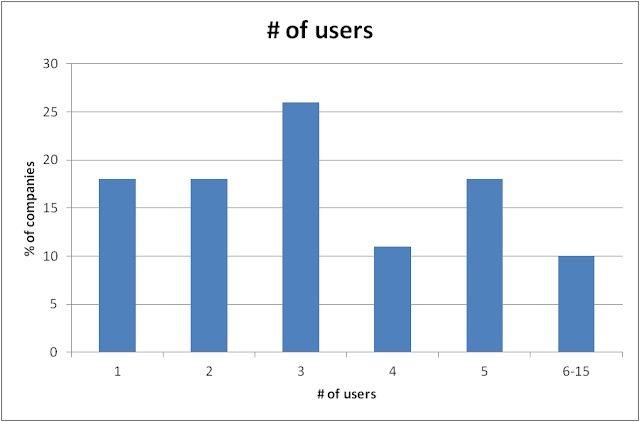 So far we’ve covered metrics which are inherent to any business that buys, manufactures, sells or distributes goods. Let us now take a closer look to the number of people a company actually collaborates with; its clients and suppliers. Efficient handling of clients and suppliers makes sure a company can build and keep track of all the business relationships involved. Even if this number grows large, megaventory can help with easily tracking all interactions and operations involved. 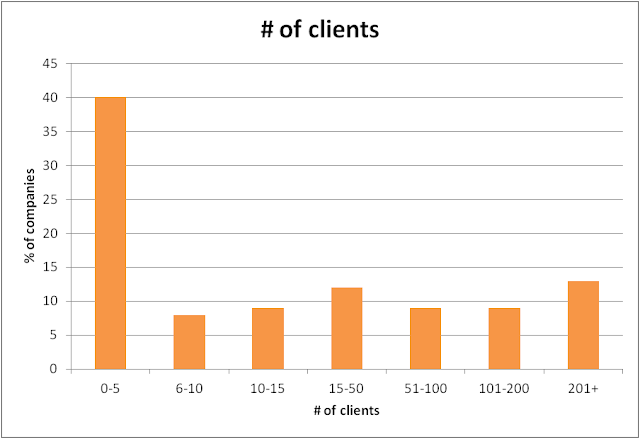 When it comes to clients, although most of our customers (40%) have a relatively small number of clients (<6), the rest of them coordinate their operations successfully with as many as 200 clients or more in a uniform distribution. Essentially this means that megaventory enables companies to keep track of their client base equally well at a broad range of volumes. In other words, any complexity or overhead involved when managing 10, 100 or 500 clients is hidden entirely. Similarly, the number of suppliers tracked for our customers is in almost a third of the cases less than a handful - this is to be expected from a small business which usually has a relatively simple operation in place with few suppliers required. 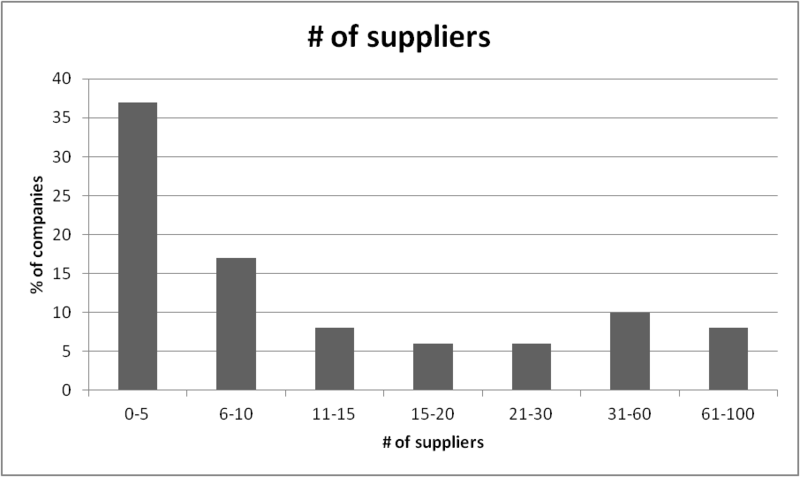 On the other hand, as many as a 100 suppliers can also be handled seamlessly and with ease using megaventory as the relatively uniform supplier distribution shows. As with clients, megaventory is immune to the complexities of handling large number of suppliers and manages to remove any related overhead. Another extremely powerful feature is that of being able to organize the manufacturing part of a business. Megaventory is one of the few companies among SaaS ERP solutions which offers this functionality and approximately 10-20% of our customers have adopted the manufacturing module in their day to day operations. Looking at the data, about a fourth of the companies are putting the manufacturing module in limited use having issued only a handful of work orders (2-5). The rest of our customers have been using manufacturing considerably or heavily given the tens and hundreds of orders respectively. 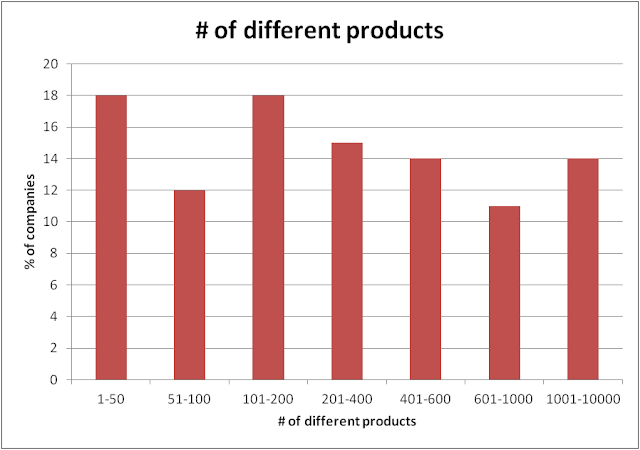 Even considering the limited sample size and the corresponding small numbers statistics involved overall, the above serves as an excellent proof megaventory can also deliver on the manufacturing front too. 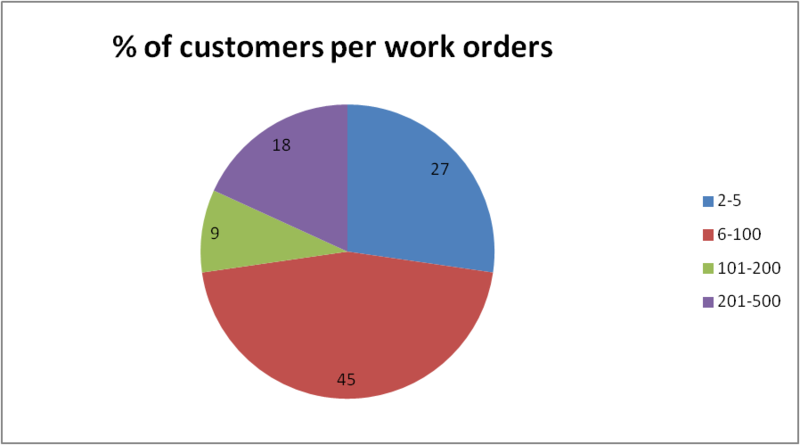 Looking at the big picture this all demonstrates that our customer base can manage their day to day business tasks regardless of their staff size, the number of products, the different locations and the number of clients and suppliers. It’s important to know that there exists a service that can take complexity out of the equation and can keep track of all your business needs seamlessly. Moreover, it’s exciting to know that all this will be true both now when you might be 4 people strong and later when you have grown to having 40 people on your payroll. The only question left then is simply where does your business fit in the above profile?